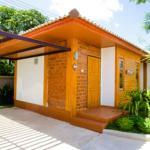 The 3-star Hup Pa Tad Homestay offers comfort and convenience whether you're on business or holiday in Uthai Thani. Both business travelers and tourists can enjoy the hotel's facilities and services. Express check-in/check-out, car park, smoking area are on the list of things guests can enjoy. Designed for comfort, selected guestrooms offer television LCD/plasma screen, air conditioning, desk, balcony/terrace, blackout curtains to ensure a restful night. Access to the hotel's garden will further enhance your satisfying stay. For reliable service and professional staff, Hup Pa Tad Homestay caters to your needs.